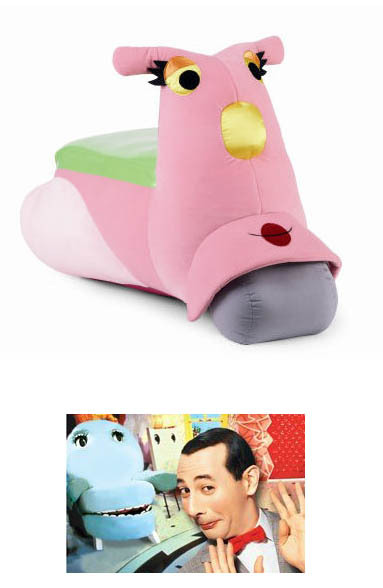 Is it me or does this remind you of a scooter version of Chairy from “Pee Wee’s Playhouse”? It measures a whopping 27″ x 19″ and runs about $100. It’s meant to be sat on by toddlers (sorry adults) and has “soft squishy action – great for gentle bouncing. Also doubles as a great room decoration or chair.” And there you have it! This entry was posted in Decor, Toys and tagged chairy, pee wee's playhouse, plush toy, scooter, situpon, vespa by Tracy. Bookmark the permalink.